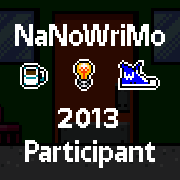 Yes, it is November 1, the opening day of NaNoWriMo 2013. Thousands of aspiring novelists worldwide are typing away, trying to keep at that 1600+ per day word goal to make it to the glorious 50K finish by the end of November. I did win the NaNo challenge, to write a 50K word novel in November. Once. It was my first novel so I also locked it away where it could harm no one. Since then my attempts have left me with a word count widget saying that at my current pace I will finish my novel sometime right after the next ice age. I dig the idea behind NaNo, I really do. Encouraging writing is very important and I applaud everyone trying to reach that finish line. The pace just does me in, though, leaving me with a visual of my inadequacy and inability to write 1600+ words everyday, especially during the holidays. So what to do? My Twitter feed abounds with writerly advice, word wars, and all kinds of novel-writing frenzy. Here's what I'm planning this November. Sara's friend had the great advice to just write 30 minutes per day, no excuses. This I can do. This I will do, and so can you. Face it, we spend way more than 30 minutes just browsing the internet. Using the November writing frenzy to get into a regular, sustainable writing routine is a worthy goal that is achievable too. This is my own personal goal and one that I think is just too much fun not to share. True, they aren't taking submissions right now, but that's OK. This way everyone will have time to actually edit what they've written (as you should anyways). If you have no idea what I'm talking about, read here and then go here and be prepared to spend the next few days reveling in the awesomeness that is Night Vale. Also, a Night Vale episode is 700-1200 words. Yes, we can all accomplish that word count in a month. Pick a favorite photo from Pinterest or wherever and write 250-1000 words inspired by it. It's easy and can give you a little jolt of inspiration to hopefully pull you out of any writing doldrums. I'll be tweeting and posting some of my favorites throughout the month. I think this should almost be the first challenge, because if you are really going to be a writer, then you need to have some readers. You need feedback. You need someone to tell you what works, what doesn't, what is confusing, and so on. It's scary, I know, but necessary. Online or IRL, try to reach out to other writers. Don't just choose someone who will tell you everything is great. As gut-churning as it can be, that constructive criticism will help you hone your craft. How about you? Are you NaNo-ing this year or choosing your own adventure? Note: A big thanks to Sara for the title of this post. The only Nano type writing I'm doing is on my graduate school research proposal. I think the 30 minutes a day rule would apply marvelously to this! Thanks for the idea! I'm Nanoing this year. Last year I had to bail out due to life drama but this year I've co-opted my husband and we're doing it together. I've never really struggled with the 50k but I'm one of those writers who writes a lot of crap for every bit of gold. I love the IDEA of NaNo but I'm way too critical of my own writing to actually amass any kind of legitimate word count, let alone a whole novel-y thing. I absolutely love the idea of writing an episode of Welcome to Night Vale! It has consumed my life, and I've spent way too much time on Tumblr contemplating how to make the appropriate Night Vale art, and an episode is just about my speed. I'm off to visit the internet to find out if there is yet a place where someone is compiling fan-written Night Vale episodes.